Since I was thirteen my education was constantly interrupted by a certain ‘monthly visitor’. I’m now in the second year of my PhD in Modern History and my ‘lady bits’ continue to wreak havoc on every aspect of my life. Yet, sensitivities being what they are, I dare not talk too loudly about my ovaries. In the second year of my undergraduate degree, I collapsed in university and the teenage problems I’d had with my periods advanced to a whole new level. Since puberty my entire life had been spent trying to control the heavy bleeding and pain that came every month. I was told by doctors that it was normal. I was a woman, this was just my lot in life. At 20, I found myself living with chronic pain: a pain no longer limited to a monthly cycle but which affected me every day. The remainder of my undergraduate days were spent sacrificing every other part of my life so I could finish my degree and do so to my own high standards. A few months before graduation, I was diagnosed with Poly Cystic Ovarian Syndrome (PCOS) and put into an artificial menopause. When that only made the pain worse, I was told the pain was in my head and I needed to see a psychiatrist. While writing up my MA dissertation, surgery diagnosed endometriosis as the cause of ten years of pain. Endometriosis is a gynaecological condition where the lining of the uterus – the “endometrium”, the tissue that is shed each month as a period – grows outside the uterus in other parts of the body but reacts the same way. But uterine lining outside the uterus has nowhere to go. It causes internal bleeding, inflammation, adhesions and cysts, often sticking organs together. With a confirmed diagnosis, I was finally able to register as disabled at my university, having spent the previous years telling every tutor individually that there was something wrong with me but no one knew what. I began my PhD in October 2012. A few months in I had to go on leave for an operation to remove the endometriosis. Even having the diseased tissue surgically removed did not rid me of the problem: the endometriosis will grow again and there is no cure for the condition. Doing a PhD is never an easy thing but doing one with an illness, any illness, makes it all the more difficult. If that illness is invisible and you look “normal” on the outside, it is an additional challenge – people tend to believe what they see and unless you are curled up crying in a ball on the floor (probably not appropriate mid-conference) it’s hard to understand what they cannot see. When that invisible illness is a “woman’s thing”, don’t even go there. Most of my peers are male, as is my supervisor, and my best friend and office-mate. While my institution is very supportive, at times it is exceptionally difficult to address the elephant in the room. On top of the chronic pain my condition causes, I also have fatigue, extreme hormonal fluctuations and am prone to infections and problems of an intimate nature as well as the constant fear of future fertility problems. On a conference trip during my MA, I could not help bursting into tears after the conference dinner. I had a vaginal cyst that had developed into an abscess. I had travelled to the conference by car with my best friend and two male lecturers from our university, every hour that passed causing considerable discomfort. Nothing eased the pain I was in and embarrassment dictated that the problem had to remain completely secret. Being a woman in academia is tricky enough at times. My unisex name means I’ve turned up for meetings with new people and they immediately stated their shock that I’m a girl. Being a woman who cannot wear trousers thanks to the abdominal and pelvic pain means I only wear loose fitting dresses and skirts. That, coupled with my personal preference for bright colours (I’m convinced it’s impossible to feel anything but cheerful when wearing bright yellow) and my long blonde hair, has resulted in certain first impressions about my intelligence, or lack thereof. Someone once confessed they hadn’t expected me to be clever because I was wearing pink heels. But being a woman whose womanly parts control her life? Unthinkable. As women we are trained to pretend periods don’t happen, to brush the yucky things like bleeding and PMS under the carpet, to shoulder the burdens of being a woman without fuss or complaint. As academics-in-training, we are told our research should be the sole focus of our lives, every waking minute devoted to it. As a PhD student with endometriosis, there are no guidelines. I can’t pretend that my reproductive organs chug along happily, doing exactly what they should, because honestly, they rule my life. My research is very much a passenger, my uterus firmly in the driving seat. Pain-free days are rare. The best I can hope for usually is that I’ll just be vaguely uncomfortable, like a little knot inside my pelvis that is just letting me know it’s still there. At its worst, the pain feels like a rusty hook has been shoved inside me, dragged around to cause maximum damage. On ‘rusty hook’ days, I can barely get out of bed to refill my hot water bottle let alone concentrate on research. Most days linger between the two extremes of the spectrum, the pain kept at bay by my range of medications and the self-management knowledge I’ve gained living with the disease for so long. I simply can’t work the way other people at my university do. I go to training sessions or workshops and get engulfed in the clouds of shame and guilt that I’m not fulfilling the ‘normal’ amount of hours PhD students should be working on their research. My peers chat about spending days on end, sometimes weeks, working in the archives from opening to closing then sitting up most nights with secondary literature, surviving on four hours sleep. My time in archives is planned with careful precision. I know I cannot sit still (in the often very uncomfortable and unsupportive chairs) in one place for too long. I know that if I spend one day in an archive, the next day I will be good for nothing. I know that driving to places, walking around them, costs me valuable energy. Attending academic events like seminars, lectures, talks, book launches, costs too. While not compulsory, it is always noted by someone when you are absent. But I have to prioritise. I can’t do it all. A few months in to my PhD, when only a select few were aware that I was ill, I attended and spoke at a conference held at my university. During the second day, I was visibly deteriorating, popping pills, shifting and squirming in my seat, growing paler and weaker as the day went on. Someone remarked that I must be seriously ill and should see a doctor. Because I had grown used to putting a brave face on my pain, wearing a smile no matter what, people just did not understand the devastating effect my condition was having on my body. My illness is not a secret anymore. I’ve grown bored with the expectation that I use vague terms to describe my pain. It’s frustrating that just because it’s my uterus and not my lungs or stomach, I can’t talk about it as openly. I wear a yellow ribbon and a wristband for endometriosis awareness and will happily talk about it to anyone that has questions. When people ask me how I’ve been, I answer honestly. I mention my campaigning for a regional endometriosis clinic for my country, I mention my support group, my doctor and hospital appointments. I know fine rightly I make people uncomfortable and awkward but how can I, or any other woman, expect people to understand what it’s like unless we start talking about it. My operation improved my quality of life dramatically but over the last few months, my symptoms have been returning again, bringing some new ones with them. With an increasing level of awareness and communication within academia for disabilities, physical problems as well as mental health, I feel that it is vital to remember women’s health – and the health of all those with uteri – within this discussion. I am still finding my feet, juggling endometriosis and my PhD, improvising when the two collide. It feels like I am charting new waters, boldly going where no woman has gone before. This is ridiculous really, when one in ten women have endometriosis, a similar proportion of those with asthma or diabetes, yet everyone has heard of those conditions and they are not met with awkwardness and embarrassment. ‘Women’s problems’ affect everywhere women are – so why is it still taboo in universities? Editor: We’re aware that problematic uteri aren’t just a “woman’s problem” and that many people – including trans* men and non-binary folk – experience similar issues, no doubt complicated by the tendency to associate uterine difficulties with “women’s problems”. Nonetheless, this article captures quite beautifully both the institutional presumption that any conversations about having a uterus are not sound topics of discussion, and the fact that chronic illness & disability too often come with gendered baggage. If anyone with similar bodily experiences who doesn’t identify as a woman would like to speak to this experience, we’d love to post it here. This article was kindly submitted by @randomrobyn who is a 2nd year PhD student in History at Queen’s University, Belfast. Her research focuses on poverty and poor-relief in 19th Century Belfast. 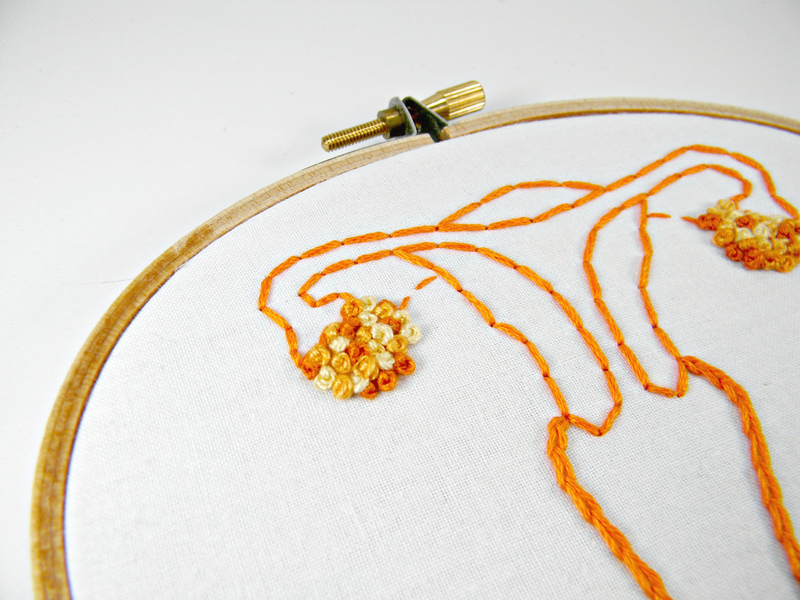 Image: Uterus Anatomy Embroidery Hoop Art Wall Decor in Orange by Hey Paul Studios. Licensed under Creative Commons 2.0 Generic. I am dealing with some of the same symptoms and setbacks when it comes to furthering my education. I get so close to graduating and have a setback. It is very frustrating but I try to keep faith it will be worth it in the end! I hope you find a way to manage your pain. I have chronic pain and illness and it is a challenge. Good luck! Re the PhD, I also was intensely aware of how little I would spend working on some days compared to other candidates, and I never even thought of approaching the college to see if there were any supports as I never even considered myself as having a disability. In good news I did manage to achieve my PhD after 4.5 years work, unfortunately I’ve been out of work bar the odd precarious post (mostly short-term badly paid academic work) since and my cycle syndrome symptoms continue to exponentially worsen. Your blog really resonated with me. I also suffered (and still do) from endometriosis. It only hit me when I was doing my PhD – I’d never even had period pains before (and truthfully, I was a bit skeptical of those girls who went around clutching hot water bottles) but then suddenly, I’m doubling over in the middle of the street or having to hold onto walls whilst I cope with gruelling spasms. Sitting down at the desk or microscope seemed to compound the problem, and the number of times I was close to tears at work because of the pain which wouldn’t go away no matter what pills I took was very difficult to cope with. The constant dull to ripping aches affected my concentration and my PhD suffered. I eventually got a 6 month extension to account for the time taken dealing with the problem. Luckily my supervisor’s wife had the same issues, so he understood when I told him the diagnosis after my operation and didn’t ask questions if I occasionally took a few days off or grimaced mid-conversation! It’s definitely easier sometimes if people know, though it is a delicate matter, which as you say, it wouldn’t be if it were a different part of your body. My gynaecologist suggested that my fertility had been affected and that I would find it very difficult to conceive. He suggested that I begin to try so that I could access fertility treatment (you have to love the NHS!) before I was 36. It was a difficult decision. I had finished my PhD by this point and was at a Russell Group University with only 10 months left on my postdoc contract – I needed to get a job, not get a child! Still, I took his advice, thinking it would take fertility treatment to conceive, therefore thinking I had at least 2 years to get established in a career. Six weeks later I was pregnant! I’ve got a lectureship at a decent university and a six year old boy who keeps me more than busy. It’s difficult to balance work and life (especially since I am now a single mum – like academic life isn’t difficult enough!) but I don’t regret it. Many thanks for this reminder. We tried to speak to this precise point in the editor’s note at the bottom of the piece where we include our rationale for still allowing the author’s own clearly gendered experience space to be aired.